What is a profit and loss statement? Your profit and loss statement (also known as your P&L or income statement) is the most popular and most common financial statement in any business plan. It’s the financial statement that bankers and investors will flip to first when they’re reviewing your business plan. The P&L tells you if your company is profitable or not. It starts with a summary of your revenue, details your costs and expenses, and then shows the all-important “bottom line”—your net profit. Want to know if you’re in the red or in the black? Just flip to your P&L and look at the bottom. 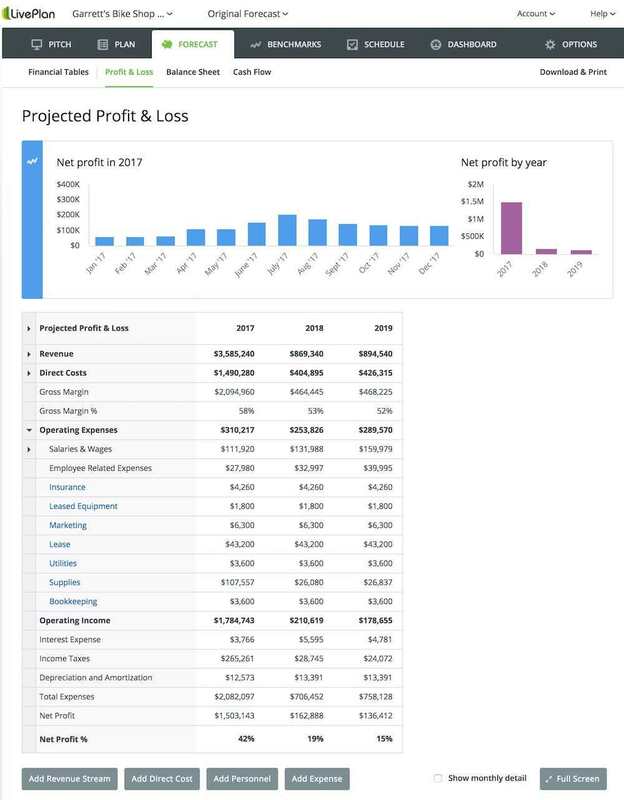 The profit and loss statement in LivePlan. Unlike the cash flow statement which can be a bit complicated, your P&L is fairly easy to read and understand. Here’s a quick run-down and explanation of what each section means and where the numbers come from. Revenue, also called the “top line” of the P&L, is the money that you’re bringing in from your sales. If you’re a non-profit, this would be money raised from fundraising. Usually, a company will have a separate table that details their sales and then bring the total sales number over to the P&L. Of course, revenue is a pretty critical number as it’s what you need to cover your expenses. The lower your revenue number, the lower your expenses need to be in order to stay profitable. Direct costs are also known as cost of goods sold (COGS). These are the costs that you incur when you make your products or deliver your services. You don’t include things like rent or payroll here, but you would include the things that directly contribute to each sale. For example, for a bike shop, the direct cost of every sale is what the shop paid to buy the bikes from the manufacturer. For a bike manufacturer, direct costs would include the cost of the metal and plastic used to make the bike. However, if you’re a consultant, it’s possible that you have very low or even no direct costs. You might have costs associated with printing reports and photocopying, but not many other costs. For more on direct costs, read our article that explains things in more detail. Subtract your direct costs from your revenue and you have your gross margin. Gross margin tells you how much money you have leftover to cover your expenses after you’ve covered the cost of the product or service you are selling. For example, if you buy a widget for $1 and sell it for $3, your gross margin would be $2. When you have a high gross margin, that means that it costs you very little to deliver your product or service and you’ll have the majority of the money from every sale left over to cover your expenses. Operating expenses cover all of the expenses that you incur to keep your doors open, excluding your direct costs that we talked about earlier. This usually includes your rent, salaries and benefits, marketing expenses, research and development expenses, utilities, and so on. Don’t include interest you pay on loans or taxes here, though. Operating income is also known as EBITDA (earnings before interest, taxes, depreciation, and amortization). This is calculated by subtracting total operating expenses from your gross margin. Here’s where you’ll include interest payments that your company is making on any loans that your company has. These are special expenses associated with assets that your company owns. Over time, assets (like vehicles and large pieces of equipment) lose their value or depreciate. You’ll expense that decline in value here. Any taxes that you pay or expect to pay on your sales show up here. Also known as net income or net earnings, is the “bottom line” that you hear about so much. You started with your revenue as your “top line” and then subtracted things as you went: direct costs, operating expenses, and so on. What’s left over is your profit, or potentially your loss if you ended up spending more than you earned. That’s your profit and loss statement explained. But, don’t forget: Profits are not the same as cash. Just because you made a profit doesn’t mean that money is actually in the bank. For an explanation of why this is, check out our detailed article here and our explanation of your cash flow statement. For more business and financial concepts made simple, check out these articles on direct costs, cash burn rate, net profit, operating margin, accounts payable, accounts receivable, cash flow, balance sheet, and expense budgeting.